February Gulf Coast Activities are happening now! It’s a new year and despite the two days of freezing cold, the Gulf Coast is back to temperate winter temperatures as things start heating up on the social calendar. So far, January has been a great month for snow birds to escape the treacherous ice storms of up north. And while the calendar hasn’t been super busy, it offers visitors time to enjoy some of the best moments on the coast with the mild temperatures and lower humidity. But I’d like to think of it as a time to rest before the coast kicks it into high gear. In just a few weeks it will be February. 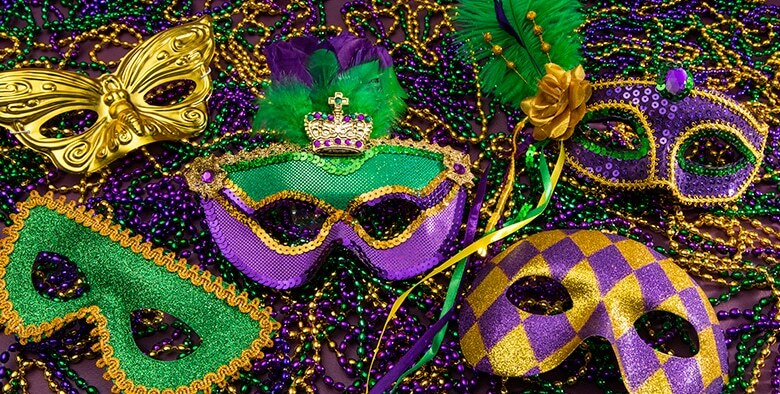 And we all know what happens in February in New Orleans and here on the coast……MARDI GRAS! That means you have only 40 more days until Fat Tuesday is here, which is February 28th for those who don’t want to do the math. Soon the streets of the cities will be filled with parades, music, food, beads, and lots of crowds gathering together for February Gulf Coast Activities. You may be surprised to learn that it wasn’t New Orleans but Mobile, Alabama to first start the tradition in the United States. This celebration has taken place since the early 1700s! It wasn’t until about 30 years later that New Orleans began openly joining in the celebration. However, the governor, the Marquis de Vaudreuil, had a different vision for celebrations. Instead of the parades, he established elegant society balls in the 1740s. Over the next hundred years, New Orleans and it’s krewe members grew Mardi Gras into the celebration we know and love today. To find out about the schedule of parades in the cities along the coast, please check out the gulfcoast.org website. If beads aren’t your thing but horses are, you may want to check out the Annual Gulf Coast Winter Classics Horse Show. This six week event begins on February 8th and lasts through March 19. There are events scheduled every day of the week except Mondays and Tuesdays. It takes place at the Harrison County Fairgrounds located at 15321 County Farm Road in Gulfport, MS 39503. For more information you can call 228-832-3691. Admission is free. If you are going to live on the coast, you may want to think about buying a boat. Why not come see what the Biloxi Boat Show has to offer? This event takes place from February 10 – 12 at the Mississippi Coast Coliseum. Admission is $8 at the door for anyone over the age of 13. Don’t forget about the Casinos, too. They have a great line-up of entertainers like Dennis Miller, Tony Orlando, Foreigner, Joe Nichols, and more February Gulf Coast Activities. So get out there and enjoy what the coast has to offer. It’s what make living on the coast so great! If you have not seen the island view lately you have not seen the Casino Renovations.